We do want to turn to a brand-new report on climate change released by the trump administration on a busy black Friday. The 1600-page report painting a dire picture if nothing is done. The potential grim consequences released in the federal report coming at a critical time as the deadliest wildfires in California still smolder. Government scientists saying climate-related threats to Americans’ physical, social and economic well-being are rising. The president who has previously called climate change a hoax tweeting just this week about the east coast cold snap, whatever happened to global warming? 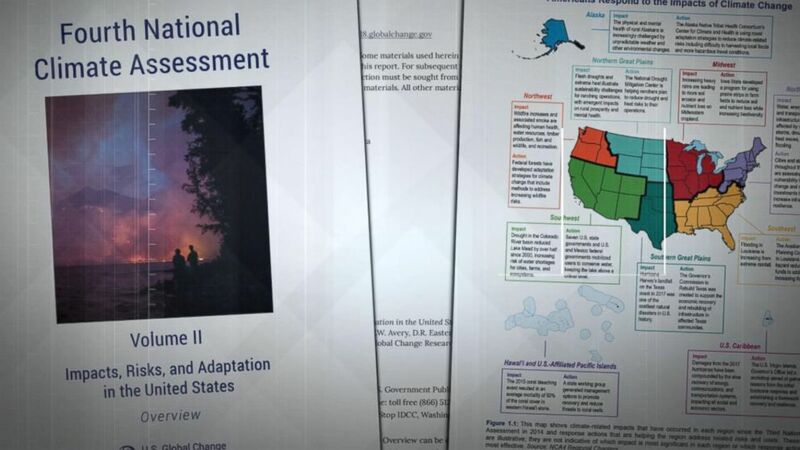 The assessment from 13 federal agencies asking the administration to take urgent action against dire threats and curb climate change to avoid substantial damages to the U.S. Economy, environment and human health. Among the report’s predictions in worst case scenarios, America’s gdp dropping by 10% by the end of the century. Hundreds of billions of dollars lost. For the southeast stronger hurricanes and more frequent flooding. The midwest, agricultural catastrophe, extreme heat destroying crops, and in the west, increased fire danger. The president recently touring a California fire zone. Does seeing this devastation change your opinion at all on climate change, Mr. President? No, no. The white house is pushing back saying it’s largely based on the most extreme scenario. We do want to bring in Sam champion. Sam, because obviously you’ve been following the weather and climate trends. This report is fascinating in the detail and long-term economic projections like we haven’t seen before. But how does this line up with some of those weather trends? It’s a good question, and the answer is really clear. For the last ten years climate scientists have been right on and pretty steady on exactly what they expect and what we can expect. One of them is stronger hurricanes, and just look at the last couple of hurricanes to make landfall in the U.S., Florence, the most record rainfall, most rainfall ever from a tropical system in north Carolina and South Carolina then we’re talking about Michael. This is the storm that that hit the Florida peninsula — Florida panhandle that strengthened so quickly. That’s the point. Rapid intensification. From a 1 to a high 4 almost 5 in about 36 hours so stuff that we haven’t seen before, that’s all true then we talk about the wildfires, the extreme heat, drier ground, bigger fires. Look at the camp fire. That was 153,000 acres and I don’t want to forget about the deaths that came from that. That’s critically important. That was a record fire for California. They had their biggest fire ever last year. We’re not supposed to do this every year. And here we are. So it’s like the science and then the government agencies kind of lining up this with report. Every report that comes out completely fulfills what the prior reports have done. It’s a stack in the wall of exactly what we can expect and there’s no change. Let’s get to the boards. We’ve got all of this snow coming out of the northwest. This is Meteorologist Amy freeze with the accuweather forecast. We’re getting temperatures above freezing, going for a high of 51 with afternoon rain expected. So mild this afternoon, rain continuing tonight. Heavy at times. Flooding is possible. We close with a high of 55 on Sunday. Showers return on Monday. Throughout the day we’ll have rain. Temperatures will be in the low 50s knocking a few degrees off for When we come back, I want to get folks ready in the northeast for what could be some flooding rain. 1 to 2 inches of rain tonight. You love to talk about this just before you head on a plane. Travel troubles. And I’m out. See you later. Right?